Elektra 979193-1. 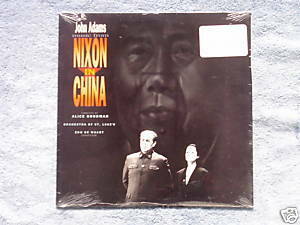 Music from Nixon in China 1988 LP. Orchestra of St. Luke's conducted by Edo de Waart. Vocalists include James Maddalena, Sanford Sylvan, Thomas Hammons, Carolann Page, and Marl Opatz. Recording includes Act I Scene I, Ladies and Gentleman Comrades and Friends, This Is Prophetic, Whip Her to Death. Time Magazine says this is the "year's best opera recording." Sealed LP with stickers. Cover is VG with top left sawcut.